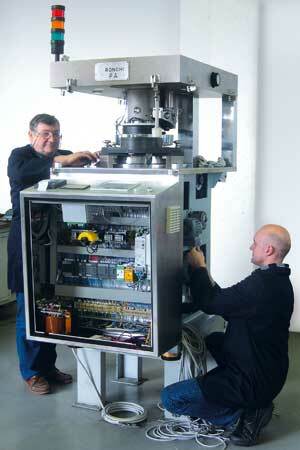 we carry out maintenance and calibration for all types of tablet presses also on those which are not produced by us. General maintenance is carried out by our internal press department and can also be carried out at the customer’s site. Used, revised and guaranteed tablet presses are always available in our site. Mechanical and electrical spare parts are always available in our warehouse. All electronic components used for our tablet presses are from the best producers in the market who also guarantee world wide assistance. Techical assistance is very important in our firm policy and it is carried out by our most experienced mechanical and electronic technicians. Assistance is available in our firm and at our customers site, in Italy and all over the world. Thanks to their high experience and know-how, our technicians are able to operate on Ronchi tablet presses as well as on presses of different manufacture. Our firm has always paid attention to the assistance given to our customers, proof of that are the letters here next.